Photovoltaic (PV) solar panel installation. 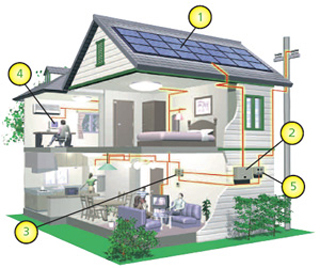 Solar electricity systems capture the sun's energy using solar photovoltaic (PV) cells (1). The cells convert the sunlight into electricity, this is then converted to AC Electricity by a device called an Inverter (2). The electricity is fed into the main distribution box (3), here it is used in the same way as the electricity that would have been normally drawn from the grid. At times when the electricity produced is more than the property is using, any excess is fed back into the National Grid, while at times of excess demand this is topped up by drawing from the grid (4). The meter will thus show the net electricity exported or imported to or from the National Grid (5). Note however that the UK Clean Energy Cashback Scheme or Feed In Tariff makes an assumption that 50% of all units generated are exported to the grid making the export meter unnecessary. PV solar cells don't need direct sunlight to work - you can still generate some electricity on a cloudy day. Generate green electricity from sunlight.and get paid, as well as cutting your electricity bill!